Sony is making digital cameras more intelligent. First there's face detection, then smil shutter, and now the Sony Cyber-Shot DSC-T700 camera has a new feature that will virtually eliminate any closed-eyed photos. Sony calls this feature the anti-blink function. 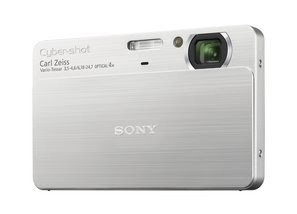 The Sony Cyber-Shot DSC-T700 takes two shots and using the face detection technology, it determines whether the subject has closed their eyes and only saves the one with the subject's eyes open. If both photos have the subject's eyes closed, the Sony Cyber-Shot DSC-T700 displays a warning so you can take another shot. The Sony Cyber-Shot DSC-T700 can also double as a portable photo album. The DSC-T700 has 4GB of internal memory and users can search for photos by date, smile, or face and you can even share your photos through slide shows. The Sony Cyber-Shot DSC-T700's scrapbook function also lets you show off your pictures in a fun, scrapbook style. Another new feature on the Sony Cyber-Shot DSC-T700 is the Picture Motion Browser which lets you downsize images from full resolution to VGA and export it to the camera's internal memory so that you can never run out of storage space. The Sony Cyber-Shot DSC-T700 will be available in late September and comes in red, champagne gold, pink, dark gray and silver. The price of the DSC-T700 will be around $400.